International Shipping Services offers a number of shipment options for the international relocation of your motorcycle. Each shipment method is customized to the individual needs of each customer depending on the number of motorcycles and destination. One of our international motorcycle shipping specialists will discuss your options and prices with you. 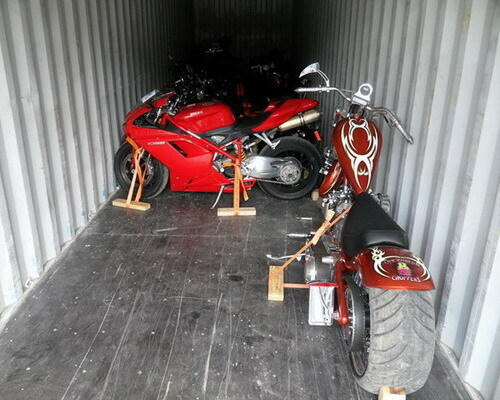 Shipping motorcycles and bikes overseas from the USA by container and RoRo. Step 1: The customer can either deliver his motorcycle with all of the necessary documents to the port/warehouse or ask us to pick it up. Step 2: Int'l Shipping's crew loads and secures the motorcycle(s) into an ocean shipping container or the port workers will load it directly onto the vessel with Ro/Ro transport. 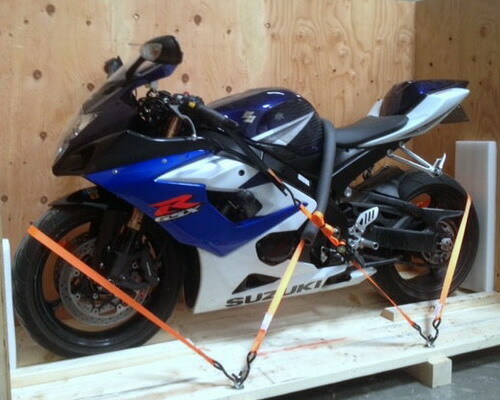 Step 3: The motorcycle is then transported to the port of departure, cleared with Customs and loaded onto the shipping vessel. Step 4: Once the motorcycle has reached its destination, it will be taken off the vessel where the port agent will see it through Customs and either deliver it to the new residence or have the client pick it up directly from the port/warehouse. We transported our Harley from New York to Italy. ISS provided fast friendly service and they took great care of our motorcycle. ISS was very prompt and had excellent customer service. We found the cost to be very reasonable and our bike was delivered earlier than expected. It was a very stress-free process. We would definitely use them again! I found "International Shipping Service" doing a Google search. They were friendly and informative on the process. I have never had a motorcycle overseas transported before so I was very apprehensive transporting a classic Indian bike to another country. Excellent email communication and clarity. It arrived on time and in perfect shape. I highly recommend ISS. I'm a motorcycle dealer in Malaysia and I constantly purchase motorcycles in USA for my business. Having tried a few shipping companies in the past – I finally found ISS and been using them ever since. They arrange the pick up from the sellers and then consolidate my motorcycles at their warehouse and pack them in the ocean container. That saves me a ton of money.